Balance Body & Soul Nutrition // Health Tips Blog // Why Choose a Plant-Based Diet? 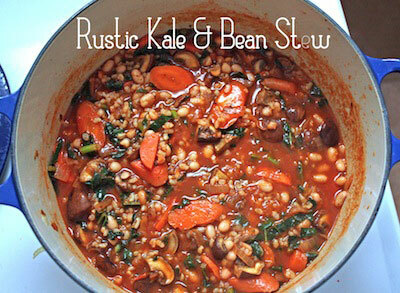 Plus a Kale and Bean Stew Recipe! Why Choose a Plant-Based Diet? 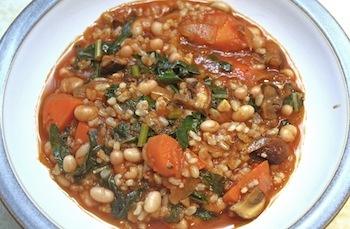 Plus a Kale and Bean Stew Recipe! Whether you’ve made this the year that you take control of your life and health again, or you’re already on your way down the path towards better health, trying to make sense of all the different diet types out there can be daunting. Should you be vegetarian, or vegan? What about going gluten-free? Or maybe you should try following Paleo for a month? Though we say we’re not looking for the next “quick fix”, it’s tempting to make a choice based on the idea that it will make losing weight easier. Whatever your ultimate reason is for choosing one diet style over another, be it politically, medically, or emotionally driven, you should know that you don’t have to put a label on it if you don’t want to. It probably won’t come as a surprise to you that I’m 100% supportive of plant-based diets. The World Health Organization states that obesity, chronic illness (including cardiovascular disease), cancer, and diabetes account for nearly 65% of deaths worldwide. That’s a huge number, and given the massive increase in the number of people who consume large quantities of processed and refined foods, drink soda, and avoid fresh fruits and vegetables, it’s not hard to make a correlation. People who eat only plant-based foods (vegans, vegetarians) tend to eat fewer calories, less saturated fat, and have a lower risk for chronic illness and heart disease. I disagree with the emphasis many people seem to place on putting a label on how they eat. I understand that a label certainly makes it easier to explain to people what you eat (especially if you are vegan and morally opposed to animal products), but for the people who are just trying to be healthier, or don’t want to be nailed down to one specific eating style all the time, a label can be restrictive. There is nothing wrong with a vegan diet, if you’re not indulging in refined sugar, white flour, or not eating enough quality protein. But if you’re not actually politically or emotionally motivated to be a vegan, and suddenly feel like eating a piece of fish, or an egg, that label and the statement that it makes could make you feel like you’re not “allowed” to. I eat a plant-based diet, but I also eat meat, fish, eggs, and some dairy (mostly goat) in moderation. I’ll be honest, I feel best when I consume less meat, but I’m not ready to give it up completely. The same with dairy. I love eggs, and I love fish, so they’re not going anywhere either. So, how do I balance how great my body and mind feels when I avoid meat and dairy, with what I still enjoy eating? Well, during the day I follow a mostly vegan diet eating balanced meals that are plant-based. In the evening, I add some animal or fish protein into the mix, but 2-3 days of my week don’t involve eating meat or fish at all. This works for me, and it works for my family. I don’t put a label on it (though “flexitarian” most closely describes it), or try to live within the strict confines of not being able to consume certain things. But, this is what works for me, and it may not be the same thing that works for you. The point is, you need to choose to eat in a way that makes you feel vibrant, healthy, and happy. If that includes animal products, than so be it. Just make sure that most of your daily eating involves plants. This rustic stew could also be considered a soup, but I find that it usually comes out quite thick, and rather than thinning it down to make it a soup, I keep it hearty and filling. As with most things that I cook, there is a lot of room for variation depending on how you’re feeling, and what you happen to have on hand. If you don’t have tomato sauce, but have tomatoes, just add them before the stock and let them cook down a bit before moving on. 2 cups cooked navy beans (or 1 15oz can well rinsed) – feel free to use whatever white bean you have on hand! Step 1 – heat oil in large pot over medium heat. Add onions, carrots, and celery and cook, stirring frequently, until onions are soft, golden brown, and translucent. Add garlic and cook for a few minutes more. Step 3 – Stir in oregano and basil, and add cooked rice and beans. Cook for another 5-10 minutes until thoroughly warmed through. Stir in lemon juice and serve. Top with grated parmesan if you desire. You could easily add meat to this in order to make it appeal to a real carnivore, but try it without first. I think you’ll be surprised by how thick and satisfying it is. It makes a great addition to any meatless meal and is fast enough to prep and cook that it’s also great for a busy weeknight! Especially if you’ve got leftover rice on hand and ready to use!